Your true nature is an auspicious light. Your body is but one of its many creations. And yet, it can become a sleeping giant unaware of itself, ensnared by the apparent beauty or ugliness of its creations; an inversion of light that divides itself within the prism of the skandhas, thus forgetting the true power and nature of its own self. In one single thought the Mind of your spirit creates a thousand dharma realities and a myriad dharmas within these realities. It also can create that obstructing river called amnesia, inducing doubt in its own nature and true power once it dives into the colorful reflections of its own desires. The moon shines bright in the stillness of the pond. But one desired touch, an inverted contemplation of its beauty, forsakes the actual shining beauty of that very spiritual light that auspiciously creates the very image of the scene by its own self-perfection. This auspicious mirror of your true nature has no ground in this universe to stand on. It bears no residuals of defiled dharmata; although the appearance of dust is possible in the instant of a single desire. 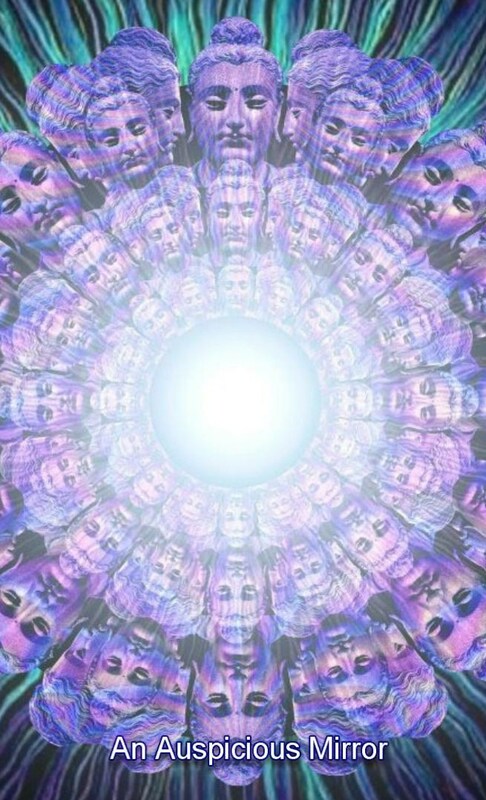 All dharmas in all ten directions are non-existent and empty of the light that emerges from your spirit. Because of that in comparison to the light of your spirit, they are indeed possible and most probable for what they are; namely, dharmas. When you learn to focus on the light of your spirit and nothing else, your spirit ascends itself to that stage that signifies the effortlessness of the awakened bodhi-child. This luminous action precedes the creation of all its images, thus recollecting and rediscovering itself. Like a burst of pure light that regenerates this universe faster than the eye can see, arising within your spirit as a true reminder of what it is. It will come to realize, within the awakening of this auspicious principle of all creation, that it has truly not attained anything at all. Like an unhindered child, it will generate the smile of contentment with no concerns. The light of nirvana does that as easy as it moves the muscles of your body and the heavens in your dreams. That is why it is known as the light of the Buddha Mind. By virtue we recognize this auspicious light in this school as the original light of the Buddhadharma, that once recalled as such, has the power and wisdom to effortlessly guide our spirit back to its originative abode of the Unborn and Absolute. This entry was posted in The Dragon Mind of Zen Tarot and tagged auspicious, Buddha Mind, Buddhadharma, desire, Mind. Bookmark the permalink.